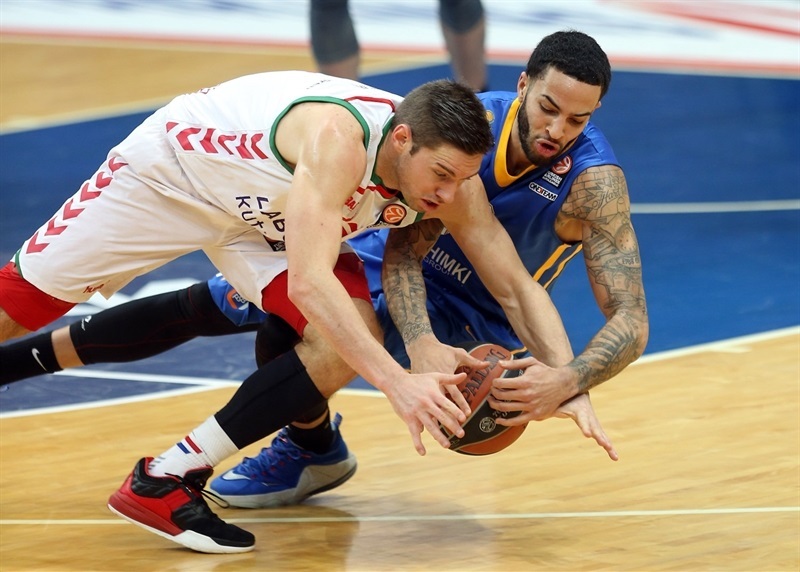 In a big battle in Top 16 Group F, Khimki Moscow Region recorded its second win by edging Laboral Kutxa Vitoria Gasteiz 76-68 in the Russian capital on Friday. 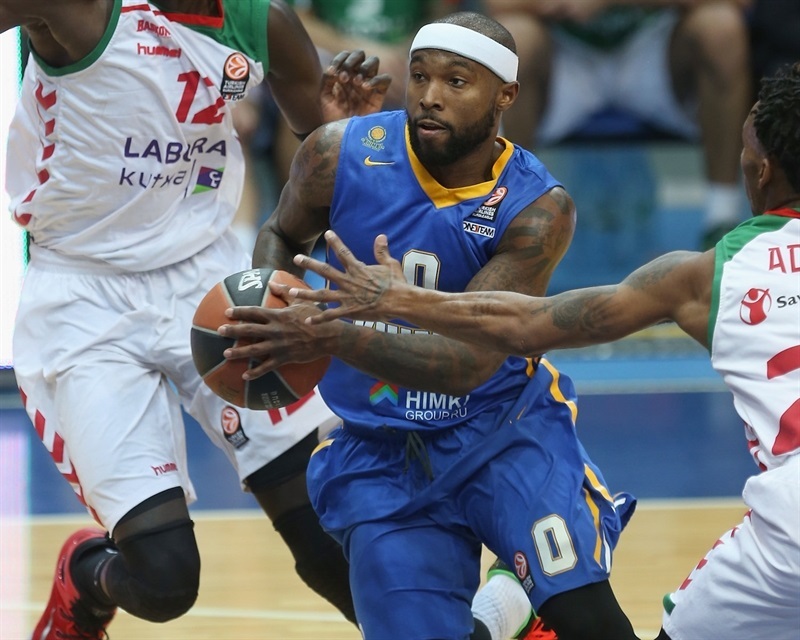 Khimki improved to 2-1, while Laboral dropped to 1-2. 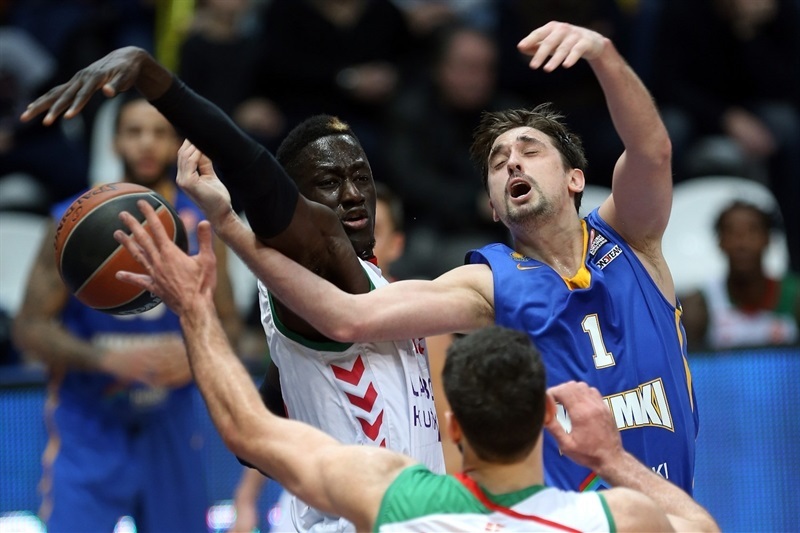 Alexey Shved led the winners with 24 points, James Augustine added 22 points and 8 rebounds while Tyrese Rice dished 13 assists for Khimki. 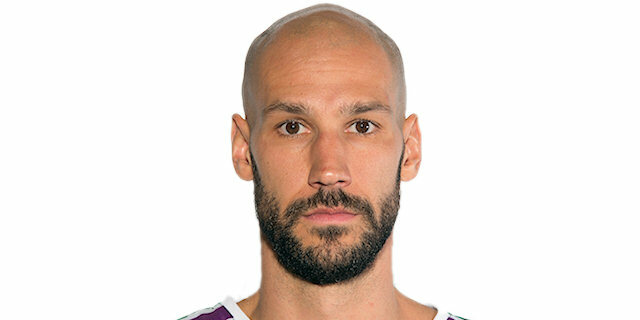 Jaka Blazic, Toko Shengelia, Fabien Causeur and Adam Hanga each had 9 points to lead Laboral - none of its players scored in double digits. Khimki had 22 assists and just 14 turnovers compared to Laboral's 15 assists and 19 turnovers. 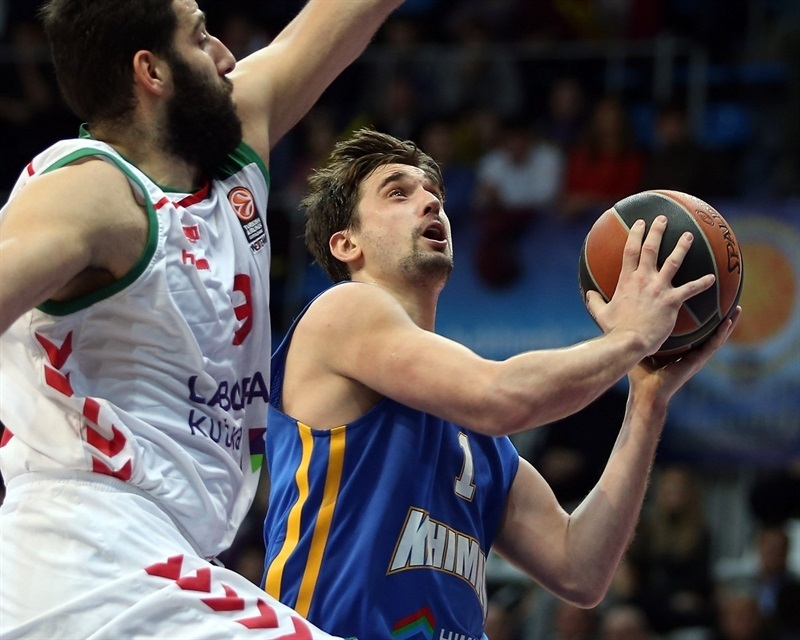 Shved shined early to give Khimki a 17-12 lead after 10 minutes. Hanga and Blazic stepped up for Laboral and helped the guests to a 30-32 edge late in the second quarter. An outstanding Augustine helped Khimki tie the game, 39-39, at halftime. The hosts improved their defense after the break and Shved led a 13-0 run that broke the game open, 59-48, at the end of the third quarter. Laboral managed to get within 68-61, but Rice and Shved stepped up in crunch time to keep Khimki way ahead until the final buzzer. Fabien Causeur got Laboral going with a layup, as Khimki struggled to score in the opening two minutes. 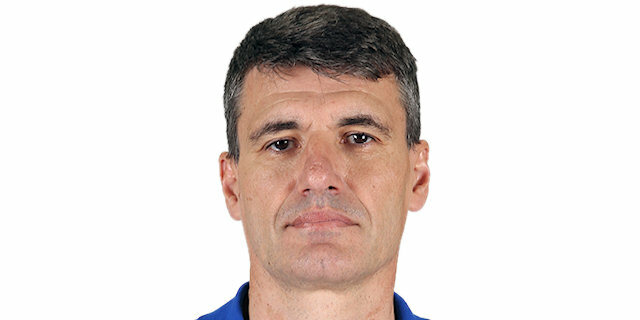 Toko Shengelia scored in penetration for a 0-4 Laboral lead. 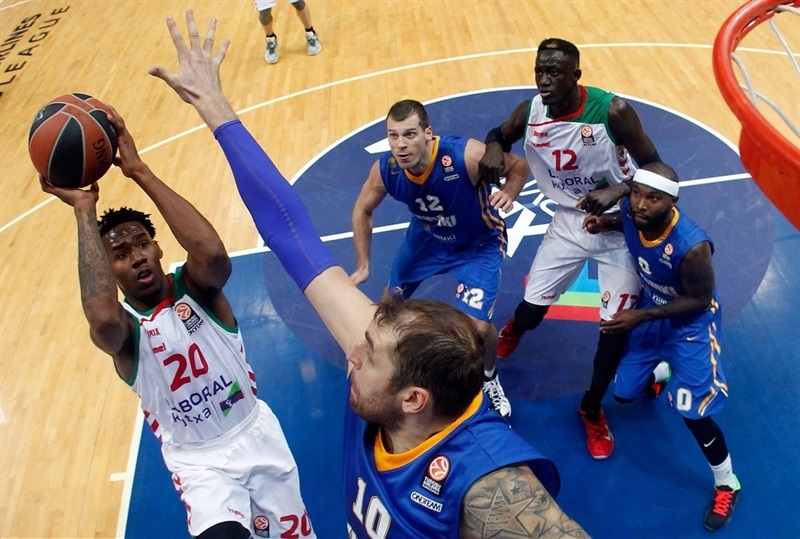 Alexey Shved rescued the hosts with a corner three and Sergey Monya bested Ilimane Diop's alley’oop slam with his own triple for a 6-6 tie. 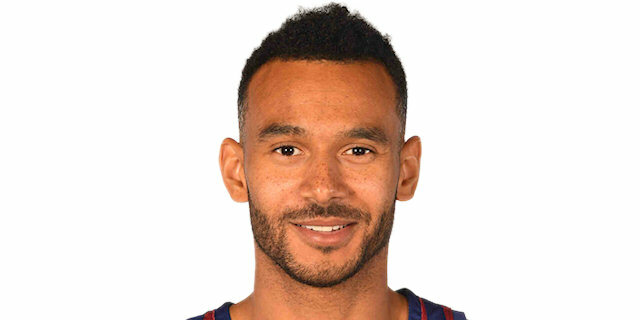 Diop shined with another alley-oop dunk, but Tyler Honeycutt erased it with a big slam and a put-back layup by Dmitry Sokolov gave Khimki its first lead, 10-8. Laboral tried to improve its offense with Ioannis Bourousis. Causeur and Shved exchanged three-pointers and a fast break layup by Zoran Dragic prompted the visitors to call timeout at 15-11. Mike James split free throws and an alley-oop dunk by James Augustine made it 17-12 after 10 minutes. Augustine hit a jump hook early in the quarter, but Adam Hanga did even better with a put-back layup - and the free throw that came with it. Jaka Blazic scored around the basket and Kim Tillie added a layup that allowed Laboral to tie the game at 19-19. Honeycutt split foul shots and a step-back jumper by James put the guests back ahead, 20-21. James kept pushing Laboral with a fast break slam, before Augustine and Hanga exchanged baskets. 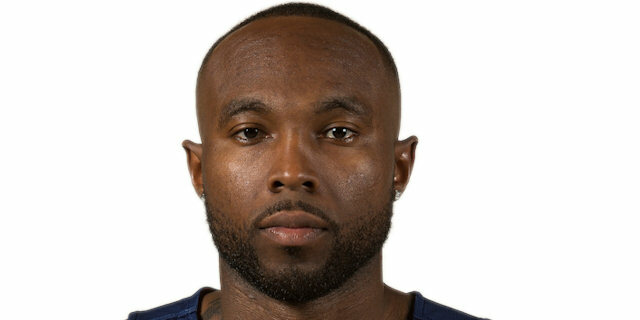 A floater by Tyrese Rice brought Khimki within 24-25. After Bourousis hit one from beyond the arc, Marko Todorovic answered with a layup. A dunk by a red-hot Hanga restored a 26-30 Laboral edge. Augustine shined with a two-handed slam and soon added free throws, but Blazic kept Laboral in charge, 30-32. Augustine scored again and split free throws, but Blazic put Laboral back ahead, 33-35. Shengelia scored around the basket and matched Shved's driving layup with free throws. Shved hit foul shots and a wide-open triple by Augustine tied it, 39-39, at halftime. Rice took over with a step-back corner triple right after the break, as Khimki started to play stronger on defense, with great intensity. Hanga tried to change things with free throws, which Rice erased with a driving basket for a 44-41 Khimki lead. Causeur took over with a driving layup and Shengelia struck from downtown to return the lead to Laboral, 44-46. Augustine ignited the crowd with a two-handed dunk and even though James banked in a close shot, a fast break layup by Shved tied it at 48-48. Shved stayed on fire with a three-pointer and a huge put-back slam by Honeycutt prompted the guests to call timeout at 53-48. 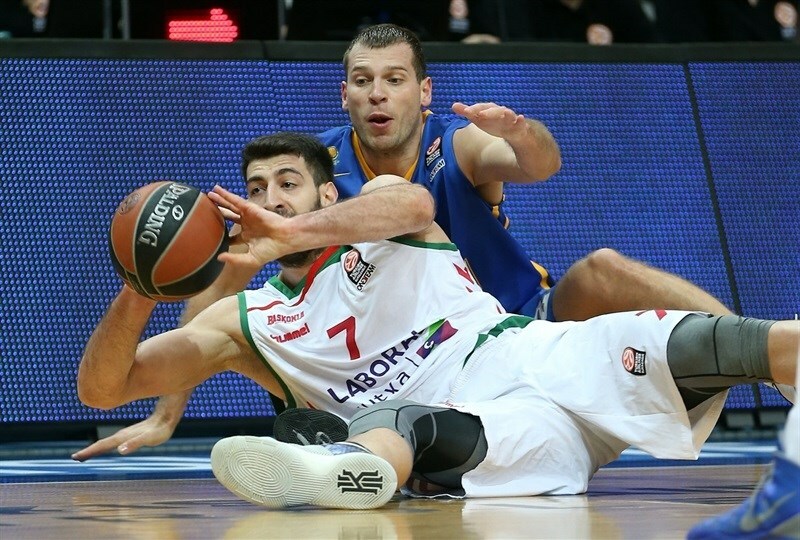 Laboral kept struggling to score, however, and Sokolov took over with a put-back layup. Shved sent the crowd to their feet with a driving layup and soon added free throws to make it a double-digit game, 59-48, at the end of the quarter. Tillie tried to ignite the visitors’ comeback with a second-chance basket, but Egor Vyaltsev quickly answered with a five-meter jumper. 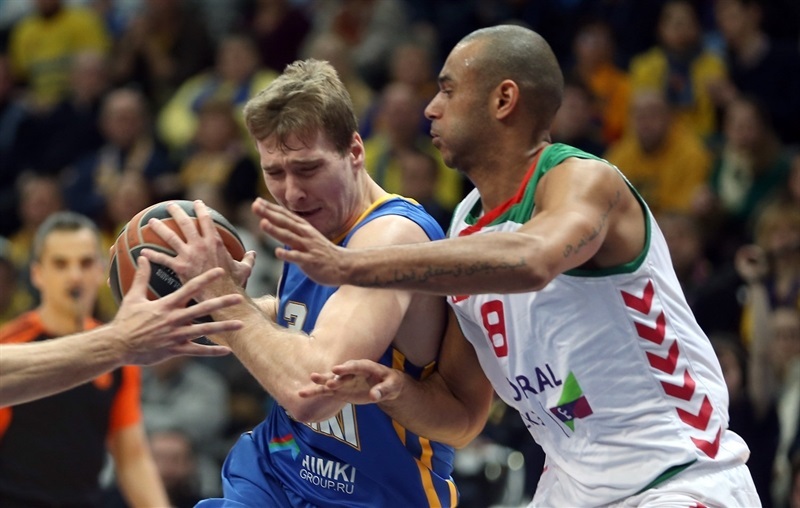 Blazic hit free throws as Khimki was forced into a few turnovers. Darko Planinic scored around the basket, but a jumper by Augustine kept the hosts way ahead, 63-54. Darius Adams buried a bomb from downtown for his first points. 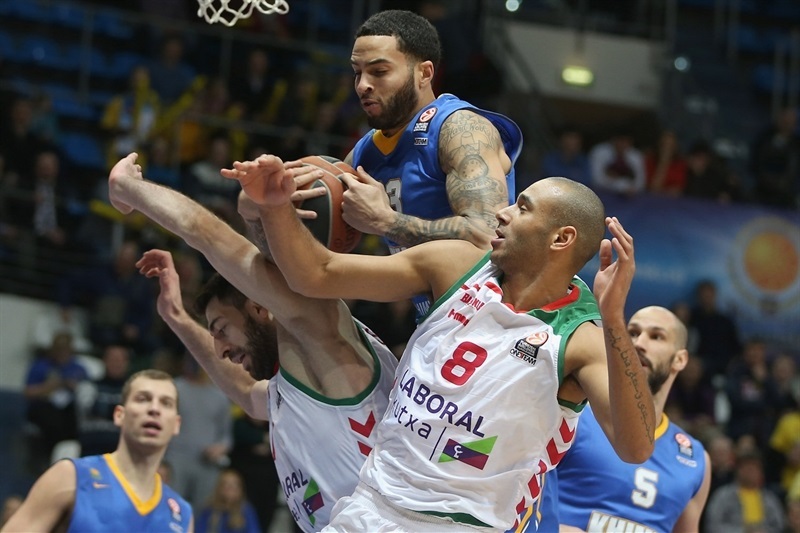 Augustine dunked again and a three-pointer by Shved caused the visitors to stop the game at 68-57. 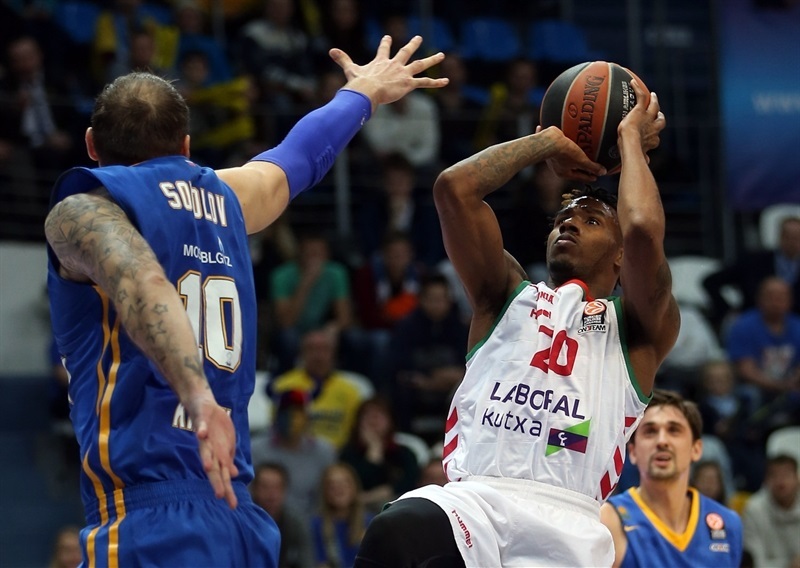 Planinic scored around the basket and free throws by Adams gave Laboral hope at 68-61. Shved took over with a big triple and an acrobatic alley-oop layup by Honeycutt sealed the outcome at 73-63 with three minutes to go. “It’s a great win for us, especially at home. They do a good job of scoring. I think they are one of the top Euroleague teams in scoring. We stopped them at 68 points. We just played well; our guards Shved and Rice played really well and we played hard on defense. We were scrambling and made pick-and-rolls and open shots. The rotation wasn’t very good, but we were playing hard. That helped us a lot." “I think the third quarter was very important for us. All the guys came out in the third quarter and defended well, while Laboral scored only 9 points. That broke the game. We knew it would be a fight, as this team always plays hard; every single game, no matter what opponent they face. We knew we had a tough task. They have guys who can score baskets from pretty much every position. I think they rank second or third in the Euroleague in scoring. The most important thing was just to try to make it tough for them to make tough shots and tough plays. I think we did that. Every game in this group will be tough. We prepare for a fight every night and try to get more consistency playing tough in both leagues, VTB League and Euroleague. So we expect the best from everybody." “We had a chance to win this game, but in the second half we made mistakes both in defense and offense. We missed a lot of shots, even in the first half. But still we were competing. In the second half they had a 10-point advantage that broke the game. We couldn’t make a comeback. The good thing is that we lost only by 8 points in the end. 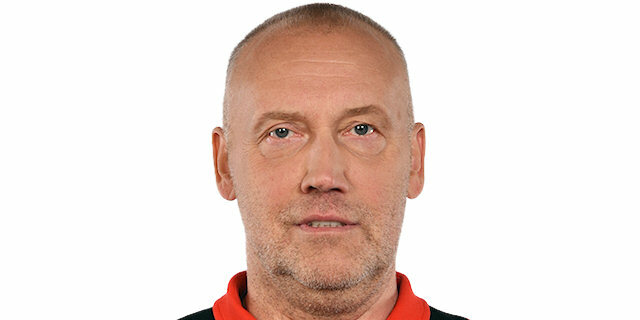 We know that Khimki have good players as they beat Real Madrid twice and other big teams like CSKA. It’s a bad feeling for us because we could have won. It’s bad, but we have to focus on other games."